You need to make this. I need to stop eating it. I’m addicted. It’s that bad, or that good, whatever. But it really only has three ingredients I keep saying to myself, and all three are good for you. And there is no sugar. And there is no dairy. And there is no soy. And it tastes SO AMAZING and SO CHOCOLATY and SO VERY GOOD. When we chose Death by Chocolate for the January Sweet Adventures Blog Hop the first thing that went through my mind was ‘oh no, the holidays just passed and all I have done is eat sweets for a whole month… blargh’. As a result I was determined to make something entirely [ok, mostly] guilt free, but not sacrifice one single ounce of flavour in the process. Done. One big fat tip – peel your bananas before you freeze them. Let me repeat that for impact – peel your bananas before you freeze them. Have you ever tried to peel a frozen banana? No? It goes something like this… Place banana with peel in freezer thinking how smart you are because you don’t need a bag or container… remove days later and try to peel… possibly get a layer of skin off, probably not… pick with fingernail and finally resort to scraping banana with a knife to remove peel even though you can’t really figure out where peel ends and banana begins… get frostbite on fingers in process… curse loudly… continue to find un-peeled frozen bananas hidden in freezer recesses for months… curse loudly. For a much better option… peel bananas, cut in half if you’d like, place in plastic container or zip baggie, freeze until needed. 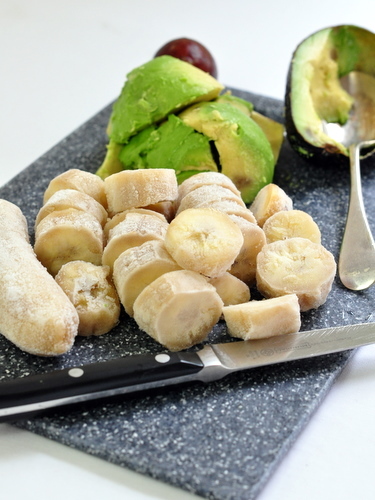 Unless your freezer is arctic, frozen bananas are still reasonably easy to slice too. They also make magical Banana Smoothies but that is a different post for a different day. You could make this in an ice cream maker. I would have used one but alas, no magical frozen dessert appliance here. I want one, badly, however owning an ice cream maker would mean that I would make ice cream on a regular basis, so on second thought… probably best that I don’t. Instead I stirred it every half hour or so until it was frozen, and each time tried just a small spoonful, you know, to make sure it was still ok.
Oh, one more thing… I may have used this ice cream to make…wait for it… Ice Cream Sandwiches. Chocolate Wafer recipe to follow very shortly. This gets more insane by the minute. You can’t be surprised really, it is Death by Chocolate after-all. 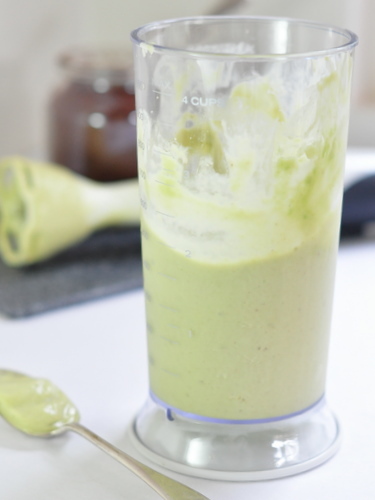 Blend banana, avocado and salt using a food processor or immersion blender until thick and smooth. Stir through cocoa powder with a spoon until well combined. Add syrup if using. Stir through cacao chips if using. Pour into a wide flat dish or container and place in freezer. Stir well every 30 minutes or so, breaking up frozen edges and mixing until smooth. Do this approximately 4 times. Alternatively use an ice cream maker, following manufacturer instructions. The avocado adds fat [good fat, not bad fat] and creaminess. Make sure to use a ripe avocado that doesn’t have stringy brown bits. No one will ever know it’s in there unless you tell them. 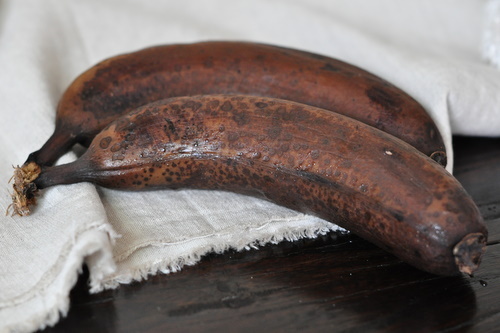 The bananas however can be as brown as you’d like, the riper they are before you freeze them the sweeter they will be. Have an amazing chocolate recipe to share? Make sure to link it up this week in the Death By Chocolate Blog hop! Christina from The Hungry Australian is hosting this month, go check out her post for instructions on how to join – and don’t forget to check out all the chocolaty goodness in the linked up posts below! Ha! it would be the perfect 4th chocolate layer for your insane cake! 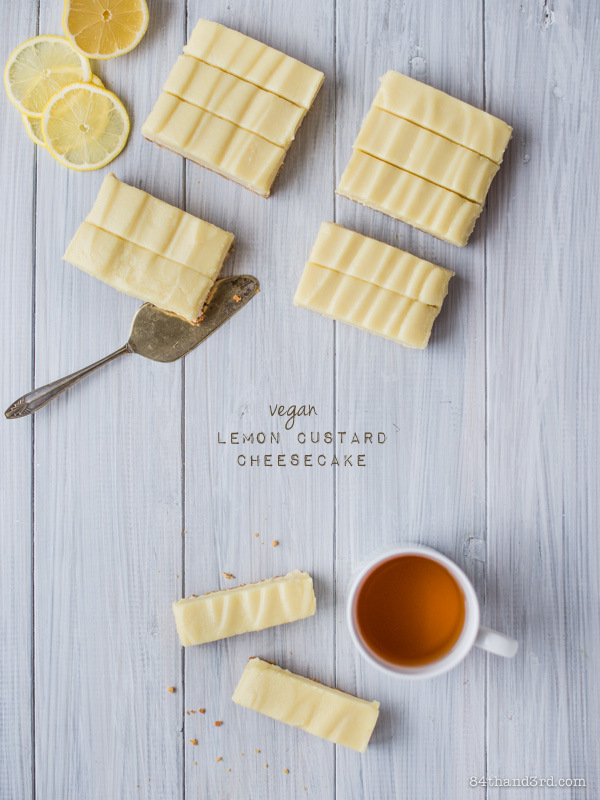 That looks delicious – I’m glad there was at least one other vegan entry into this blog hop, it is always such a shame for me to look through all the posts and not be able to make any of them 🙂 I will definitely try this one though. I also make a very decadent vegan chocolate ice cream but I use silken tofu instead of bananas and avocado – we will have to swap recipes sometime! Love this! Good to hear – let me know how it goes 🙂 I try to avoid soy so it makes it even more interesting to create ‘creamy’ when I’m not using dairy! My first time visiting you thanks to the blog hop! I’m not vegan but this ice cream sounds too good to pass up. I’ll have to try it and report back! Thanks for stopping by Laura, it’s a nice alternative to heavy ice cream. Other times only the full strength stuff will do however! Having read your “how we eat” page, I had no idea how you would pull this one off, but you’ve done it! It’s an amazing achievement, and if it wasn’t for my absolute disdain for bananas I might even give it a go! Aha! The mystery revealed! Now our conversation on Sat all makes sense! 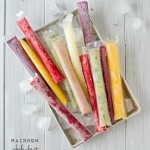 I love the idea of making ice cream out of fruit and vegetables instead of cream. I do have an ice cream maker so look forward to trying this sometime! I was being so very mysterious wasn’t I – haha. You’ll have to let me know how it goes with ‘proper machinery’! I am not very good with making vegan or gluten free things. Not because I dont like them but they seemd so healthy and unindulgent. I was going to flick past this but it looks and sounds so delicious i am going to make this for tonight. Thanks JJ! Yay – hope you enjoy it. 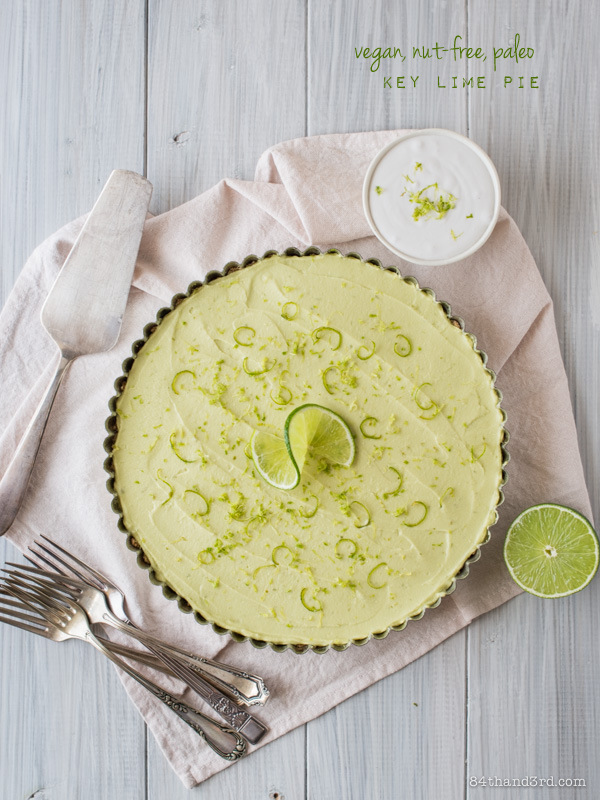 Although I try for healthy I can’t be bothered with un-indulgent – what’s the point! That’s my kind of list – ha! cute sandwiches. And yep, going to have to try this. I’ve heard about avo in icecream before but never tried it. Probably should, given the impassioned ravings on this entry! This is brilliant! I have a friend who is dairy-free at the moment and would love this recipe. 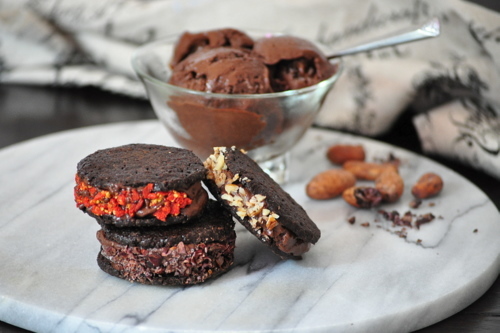 you had me at ice cream sandwich. yumm! right?! The cookies are up next! The ice cream looks seriously good JJ! Like what a chocolate gelato should be! 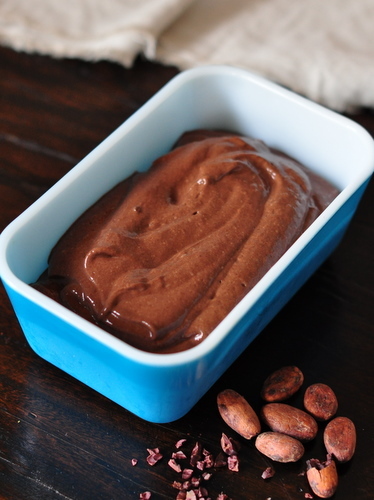 I’ve made vegan chocolate pudding with avocado before, but never ice cream. I LOVE this idea! A must-make for sure. If you didn’t freeze this it is pretty close to a pudding consistency, so that makes sense! Love bananas and avocados, your vegan ice cream sounds delicious and I guess we can all do without dairy every now and then! I’m SO eager to try this! Did you use Dutched cocoa or regular natural unsweetened? 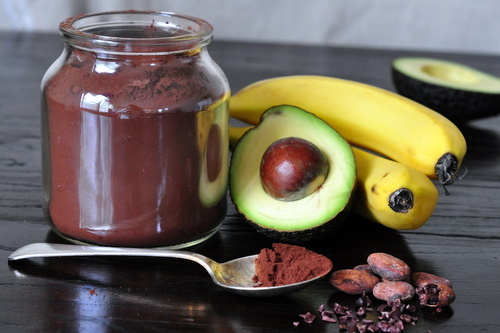 Hi Steph – I use dutched cocoa which gives it the really dark colour but you could use either. ‘Raw’ cacao powder would be brilliant too. I am really impressed JJ! 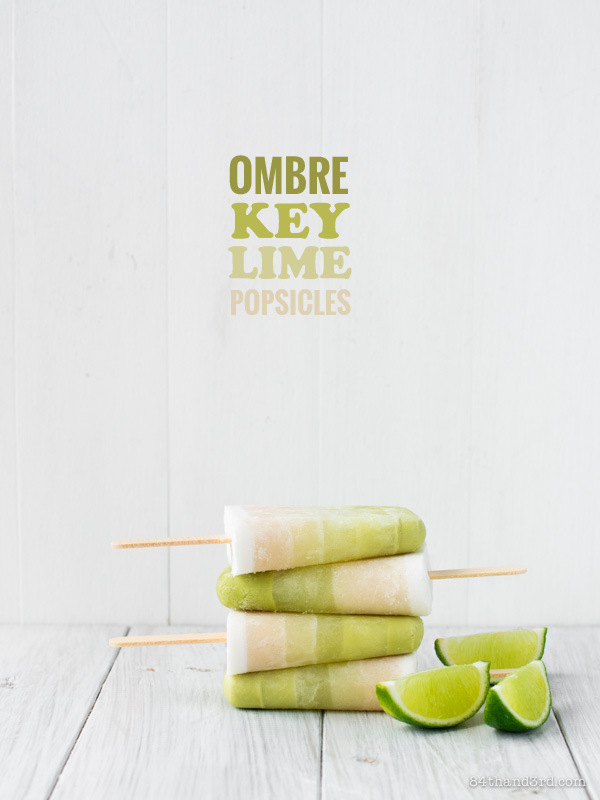 So easy and so good for you! I’m stealing this recipe for sure! Thanks Peter – much appreciated! Healthy AND delicious? Move over, and pass me one! Looks fantastic! Can’t go wrong with chocolate! You vegan ice cream looks gorgeous and not vegan at all! I will actually try and make this! Oh JJ, you are such a clever thing! I would never had guessed that there was no sugar and no dairy in this ice cream. My mother is always on my back about not feeding the kids so much sugar so this would be a great substitute. I’m definitely going to try it BTW should I be concerned that my toddler son can order ‘chocolate cake’ and ‘baby cino, please’ by himself when we visit a cafe? Ha! thanks Christina 😉 You’ve obviously taught him well, hope it measures up! What an incredible recipe! 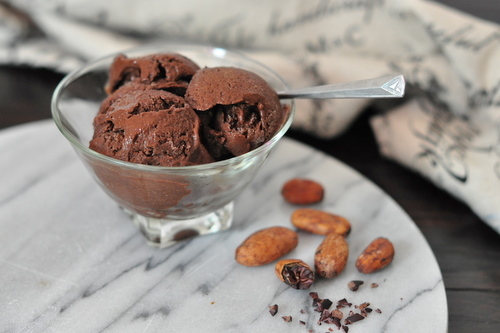 Who knew that vegan ice cream was so simple, and so delicious?! Thanks Lorraine – please do! Just ate this tonight…and I couldn’t stop! I felt so indulgent but glad it was healthy! I was so anxious to make it, I used my just-bought-still-a-little-green bananas. I will have to try it with more ripened bananas next time. Oh, and I used a little raw agave nectar. Thank you for this! So glad you made and enjoyed it! Thanks for stopping back to let me know! Funny how everyone likes it until they know what’s in it! The addition of coconut and almonds sounds great! Hi Therese, you definitely can – and making it un-frozen will actually result in a delicious Vegan Chocolate Mousse – but the final frozen result may be slightly icier. Having the banana frozen simply helps out to get it a bit more creamy. WOW! I just tried this tonight it was amazingly awesome! Chocolate icecream craving = sorted. Thank you! I bought an ice cream maker last summer, and I’ve been experimenting ever since. Last night, we had a friend over for dinner who has strict dietary restrictions, including no dairy. 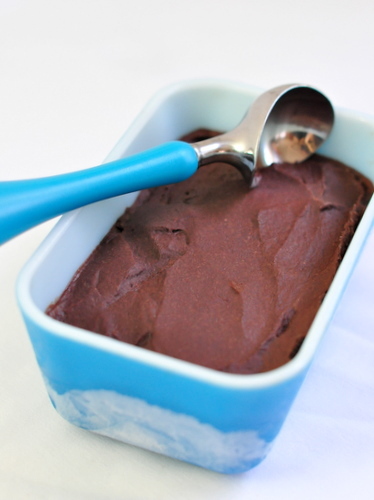 I have a recipe for vegan chocolate mousse that uses avocado as a base, so I did a quick Google search to see if there were any similar ice cream recipes, and I found this one. We all enjoyed it. The base, made of avocado, banana, and no liquid, was too thick for the paddle of my ice cream maker. It just held together in a ball. So I removed it from the ice cream maker and followed the instructions above. I used the syrup and two tablespoons cacao nibs. The ice cream was not as sweet as I expected. This was not a bad thing as everyone at dinner preferred dark chocolate. The banana and avocado flavors were also present, but that may have been because all of us were familiar with them. If entertaining for someone on a vegan or non-dairy diet, I would make this again. I look forward to experimenting with additions such as cayenne pepper or cinnamon chips.